23ABC is celebrating National Reading Day by donating several hundred books to local children. For the third year in a row, 23ABC employees have been donating portions of our paychecks to our parent company's "If You Give a Child a Book" campaign. Along with donations from our friends at Mission Family Mortuary, Kinder Pediatric, and the local Geico Office, we raised enough to buy several hundred books from Scholastic to give to our partner -- the Kern Literacy Council. We are celebrating National Reading Day with a big event at a local school where the children will get to meet a very special guest and go home with a book of their own. 23ABC is celebrating National Reading Day by donating several hundred books to local children. For the third year in a row, 23ABC employees have donated portions of our paychecks to our parent company's "If You Give a Child a Book" campaign, which was then matched by the E.W. Scripps Foundation. In addition, for the first time, the community was invited to donate. Local politicians such as Supervisor Leticia Perez and Assemblyman Vince Fong, along with local companies like Mission Family Mortuary, Kinder Pediatric, and the local Geico Office all donated. In total, more than $10,000 was raised and then donated to the Kern Literacy Council. The Council used a portion of that to buy more than 400 books which were donated to the students at McKinley Elementary School in the Bakersfield City School District. 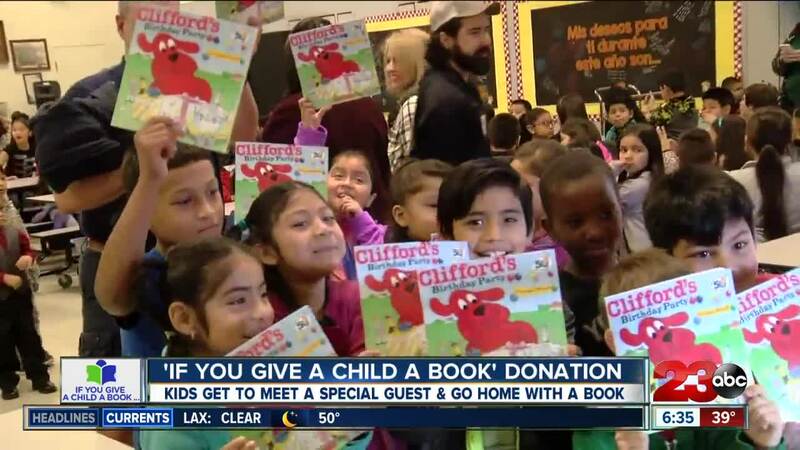 To celebrate National Reading Day on November 23, 23ABC visited McKinley to read to them, introduce them to Clifford the Big Red Dog and give every child their own copy of a Clifford book. Thanks to the money raised, the Kern Literacy Council still has money to give thousands of books to kids in Kern County. It's not too late for you to get involved, too! Snap a picture of your children reading their favorite book and send it to us using #read23 so we can spread the joy of reading across the entire county.